MolecuLight Inc, Toronto, ON, Canada. Presented at EWMA 2018. Proceedings of the Annual European Wound Management Association Conference; 2018 May 9-11; Krakow, Poland. Accurate wound measurement and tracking is an important aspect of wound care. 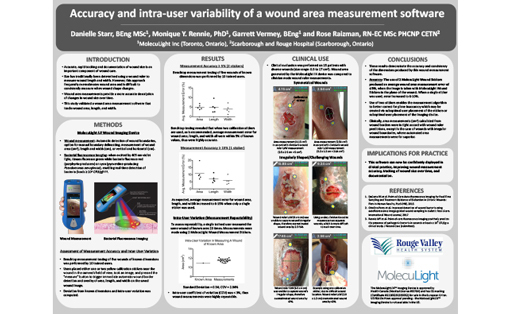 Typically, wound length and width is measured with a ruler; however, percentage reduction of wound area measurements has been demonstrated to be a predictor of chronic wound healing and treatment outcomes. 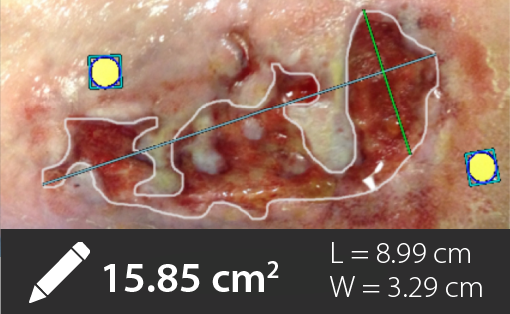 Verification of accuracy and repeatability of software that measures wound area, length and width is presented here. The software features auto and manual modes where the wound border is defined by an algorithm or the user respectively. Seventeen benchtop wound models with known dimensions were each measured 3 times by 5 trained clinicians. Clinicians placed two calibration stickers beside each wound, captured images and performed auto and manual mode measurements. Average measurement error and intra/inter-user coefficients of variation were calculated for manual and auto modes. 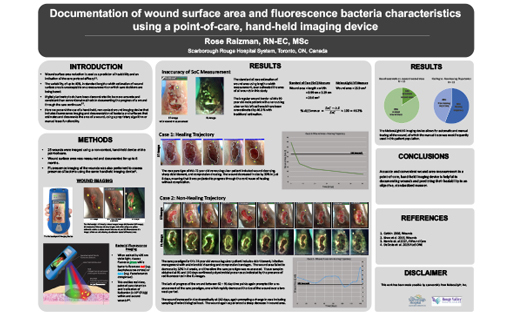 The 5 clinicians also measured 17 clinical wound images three times. Intra/inter-user coefficients of variation were calculated to further validate the repeatability when measuring images of real wounds. Benchtop wound model measurements deviated less than 5.5% from the known dimensions for wound area, length and width for both measurement modes. The intra/inter-user coefficients of variation were less than 4%. Clinical image results found intra/inter-user coefficients of variation to be less than 6%. 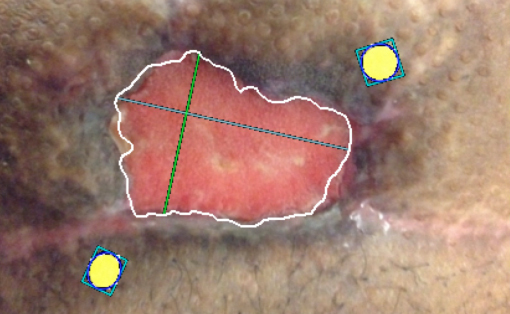 The difference in variability between clinical wound image measurements and the benchtop was expected as real wound edges are inherently less clear than models and rely more on user judgement. 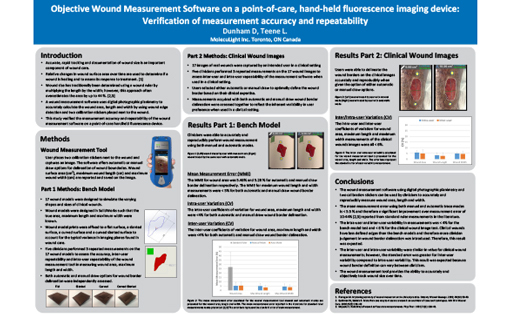 The measurement feature is accurate and consistent, and allows for objective wound measurement and documentation at the point-of-care using a hand-held imaging device.